As the world leading experts on Wearable Computing, it is a given that we are all about wearables. Therefore, wearables are the focus of this blog series! Regardless of the companies producing them, quality judgments, or preferences, we want to shed a light on the devices that Ubimax’s customers are working with to optimize their businesses. The HMT-1 model has been on the market since the beginning of 2017 and is considered the world’s first hands-free Android tablet class wearable computer for industrial workers. What makes it stand out | rugged build, outdoor display, waterproof, dust tight, drop proof, full shift internal battery. The most ruggedized AR headset out there can be utilized in real world outdoor environments. The HMT-1 can hold up under challenging conditions such as rain, heat, cold, and dust as it has been tested against heavy seas, jets of water, and micro particles. The HMT-1 also allows workers to complete their shift without needing to recharge, boasting a 9-10-hour charge with typical use. Users can be at ease knowing their battery will last and so will the device, even facing a 2-meter drop onto concrete. Able to be mounted on either the right or left side, the HMT-1 provides a flexible set up for users. It also has a flip back design that lets the monocular device move out of the eye sight of the user when not needed. The HMT-1 ensures that visual and situational awareness is not impleaded, by screen placement or the need for buttons. The HMT-1 also offers versatile possibilities in terms of occupational safety, which are useful for particularly harsh environments. Able to be worn with safety glasses, hard helmets, and bump caps, the HMT-1 is a sensible choice, with full functionality. RealWear uses the slogan #freeyourhands and they mean it. The HMT-1 is 100% hands-free with powerful speech recognition, noise cancellation, and audio. The sound output even has an option for an audio jack when using hearing protection on the job. The outdoor display also helps users to keep their hands free and manage their tasks and tools safely. Even if workers are climbing, or working in challenging conditions, their situational awareness is not minimized, ensuring safety and productivity each day. The display is also helpful for freeing workers hands, as it appears the size of a 7 tablet and remains viewable in bright sunlight. RealWear’s HMT-1 provides the necessary functionalities to serve the desk-free workers Ubimax addresses with its Ubimax Frontline solutions. The HMT-1 is safe, fast, and smart, making it a viable option for workers who need real time information in outdoor and changeable working environments. RealWear takes what is already successful and has amped it up to a more rugged and extreme level. The HMT-1Z1 can handle extreme environments being intrinsically safe for oil, gas, and chemical industries. 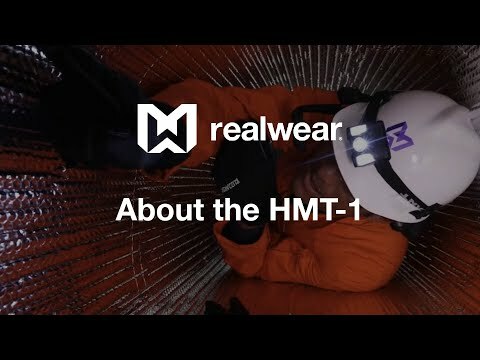 RealWear is expanding its applications and customer base through the innovations and updates they continue to strive for. Their newest HMT-1Z1 model even presents no ignition risk where potentially explosive atmospheres exist during routine operations; that is extreme safety.